Samsung Flat-panel TVs with 30 channels of HD programming. Easy-access Plug-and-Play feature makes it simple to connect electronics. 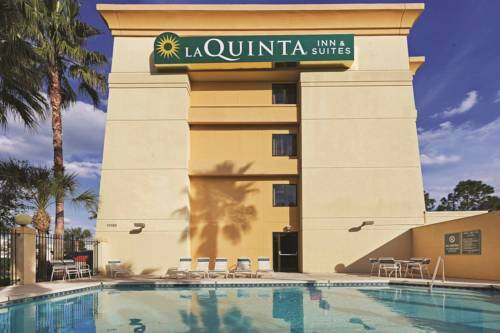 For the best value and the most convenient Houston hotel, stay at the La Quinta Inn & Suites Houston Northwest, just minutes from the Galleria Mall. In just a short drive from our hotel, you reach NASA Johnson Space Center, the Kemah Boardwalk, and the Gulf Beaches of Galveston. For events at George Brown Convention Center, Minute Maid Stadium, Toyota Center, and Baseball USA, this is the Houston hotel to stay. We are about 10 miles from the University of Houston and Rice University. All hotel rooms have interior corridor access and come with free high-speed Internet access, comfortable pillow-top mattresses, and much more. Fax/copy services available at the 24-hour front desk. Start your day with an extensive Free Bright Side Breakfast. Afterward, head out to the refreshing year-round outdoor pool or work out in the fitness center. We have bus, RV, and truck parking available and laundry facilities for our guests, so book as many rooms as you want and stay as long as you like! We are conveniently located off I-290, eight miles from downtown. Our La Quinta Inn & Suites Houston Northwest hotel is only a mile from the Brookhollow Business Park, ExxonMobil, and Cooper Industries.